A new object past Neptune has been found orbiting the Sun, nearly perpendicular to the planets in the Solar System. The newly found object, named Niku, was discovered by a team of astronomers using the Panoramic Survey Telescope & Rapid Response System (Pan-STARRS) telescope in Haleakala, Maui. And it has astronomers scratching their heads. 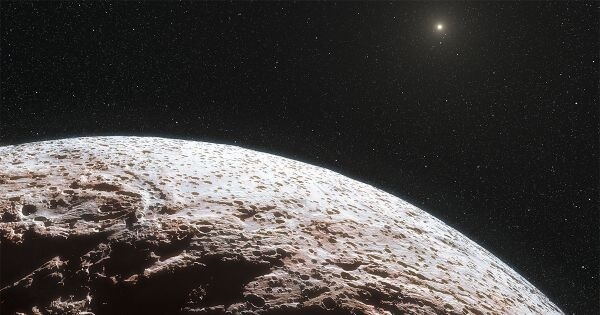 “I hope everyone has buckled their seat belts because the outer solar system just got a lot weirder,” Michele Bannister, an astronomer at Queens University, Belfast tweeted. Niku, which is around 200 kilometers (124 mi) in diameter, isn’t conforming to the Solar Systems norms: it’s not moving from East to West, but upwards. It orbits the Sun on a plane tilted 110 degrees above the orbital plane of the planets in the Solar System. But the weirdest thing about this finding is that this object is not only tilted, but also orbiting backwards, opposite the orbital direction of the planets. This is abnormal because the rest of the planets and objects in the Solar System orbit the sun counter-clockwise, or prograde. Two planets in the Solar System, however do not follow this norm either. Venus and Uranus were believed to have been hit by another celestial body, thus altering their rotation. Initially, a similar collision was suspected to have caused Niku to orbit the sun backwards, which would also explain the object’s 110-degree inclination. But while Niku could have easily been dismissed as just another collision victim, additional findings have astronomers throwing that logic out the window and scratching their heads even more. They found that Niku is not alone. Apparently, Niku is a part of an entire group of objects orbiting the Sun in this inclination, and in this direction. The mysterious and still mythical (as of now) Planet Nine was also a primary suspect to the alteration, but further scrutiny concluded that Niku is too close to the center of the Solar System—beyond a hypothetical Planet Nine’s gravitational reach. “It suggests that there’s more going on in the outer solar system than we’re fully aware of,” Matthew Holman, a senior astrophysicist at the Harvard-Smithsonian Center told The New Scientist. So do scientists have any hypotheses as to what, how, and why these objects are moving around us the way they do? “We don’t know the answer,” says Holman. Although there are no solid explanations at the moment, and the study is still up for peer review, astronomers are very excited. “Whenever you have some feature that you can’t explain in the outer solar system, it’s immensely exciting because it’s in some sense foreshadowing a new development,” says Konstantin Batygin at the California Institute of Technology.